The B+S commercial Char Broiler is available in two ranges - VERRO and B+S Black. Both units are constructed using AISI 304 grade stainless steel and feature a heavy duty grate wrap constructed from 2mm thick stainless steel. 26MJ energy efficient stainless steel burners provide maximum heat ensuring that the heavy duty radiant grills distribute heat evenly across the cooking surface. The Char Broiler series is available in three standard sizes across both ranges. 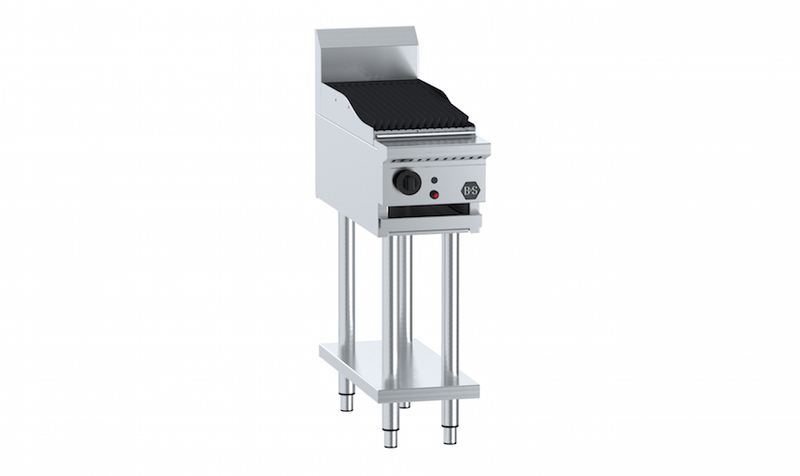 However the B+S Black Char Broiler can be combined with boiling tops and grill plates to form various configurations to suit individual requirements. The VERRO Char Broiler comes with a 24 month warranty and the B+S Black Char Broiler comes with an 18 month warranty. The B+S Black series Char Broiler is mounted on an open stand with an under shelf ideal for storing cooking utensils. The cooking surface consists of heavy-duty cast iron grates with special drainage channels that allow for fat to be directed to the grease trough located at the front of the unit. The VERRO premium fusion series char broilers deliver the bestin quality, performance and durability. All units are constructedfrom AISI 304 grade stainless steel and feature a heavy duty grate wrap which is constructed from 2mm stainless steel.